Develop Inner Focus, Lose Weight, and get Confident! At Champion Gym we want everyone to capture the full potential of their dream. Whether you want to lose 50 pounds to get an athletic physique or win a world title in any of several sports we offer, we make it simpler with the most effective fitness training programs available taught by elite qualified trainers with over 200 years of combined experience. Your goals are ours and we can get you there, in fact we will even motivate you until you find the inspiration inside. Come down today and enjoy a no obligation trial offer in a relaxed environment. 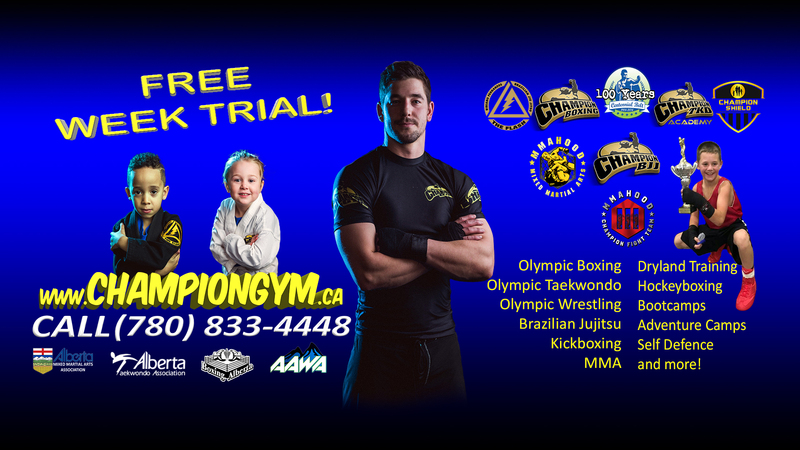 "Big thanks to Champion Gym in Grande Prairie for letting come in and get some training in. If you're in GP this is the place to train. Tons of Mat space, half cage, and all the toys you need for training!" "This place rocks. I have tried other places and felt out of place and looked down on. Here I feel encouraged and happy. Thank you so much." "I've always had great experiences at Champion glad to be back!" "Great gym, great people, awesome hours. All the tools you need to get in awesome shape." "...I have to say it was absolutely amazing...and that was the unshakeable excitement for the next session"
"A place of humble Spartans in my opinion. Great teachers all around working in a non-judgemental zone that is both inspirational and rewarding; give it a try and you won't be disappointed." "One of my favourite places to go...improve yourself check it out and really good prices 5 star for sure"